That’s from the Acknowledgements section of Imperfect: An Improbable Life. It’s easy to see why a pitcher who retired in 1999 has waited this long to recreate his life story. 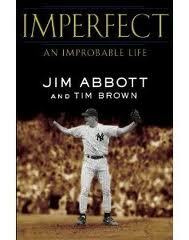 This book offers a inning-by-inning and chapter-by-chapter account of the fabled 1993 no-hitter at Yankee Stadium. However, Abbott gives us a whole lot more. Player-turned-Rawlings executive Ted Sizemore gets applause for finding the perfect glove to aid in Abbott’s fielding. Blue Jays scout Don Welke touted Abbott as a first-round draft choice worth a $200,000 signing bonus. Toronto didn’t listen in 1985, making him a 36th rounder with a $50,000 signing offer. Abbott declined, heading for college. The contract stand-off with the Angels that led to his trade to the Yankees? Abbott offers a wistful, insightful recount of what went wrong — and how he might have reacted differently today. Abbott hasn’t been the best TTM signer through the years. This tale, and others like it, dot the narrative. The hurler tired of all the focus being on his disability. Relatedly, Abbott’s devotion to corresponding with children and parents coping with physical adversity was one of baseball’s best-kept secrets during his career. With autographs, letters and meetings (all far from the media spotlight), he inspired so many in need. For the casual collector, did Abbott tire of the standard stereotyped praise about being a handicapped athlete? Did he assume all letters would be the same? The book hints at the possibility. I’m delighted at Abbott’s all-star storytelling skills. His humble sincerity and blunt honesty make for a rare combination in current baseball books. Imperfect is anything but. Read it and get a new reason to cheer for one of Michigan’s greatest diamond success stories. I was a big Abbott fan as a kid, will be picking this up for sure.